Being educated on cougar behavior minimizes risks and can help you act appropriately in the event of an encounter. By nature, cougars are elusive and reclusive, preferring to avoid contact with humans at all costs. In fact, upon seeing a human, cougars usually run. At the same time, cougars have a curiosity not unlike that of house cats. The possibility of triggering this curiosity should reinforce the necessity of taking caution when living or recreating in cougar country. Understanding the behavior of cougars can greatly minimize the potential of coming into contact with one of nature’s keystone species. Lion attacks are extremely rare. Since 1890, only twenty people have been killed as a result of an attack. While these deaths are tragic, National Safety Council statistics show that there are many other things we encounter on a daily basis that are much more likely to lead to fatalities. 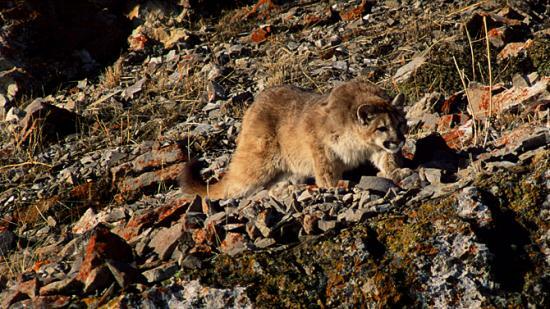 For example, compare the twenty cougar-related deaths over the last 116 years to the twenty-three people who died from dog bites in 2003 alone. Even more common are car accidents. In 2002, there were 48,366 transportation related deaths. 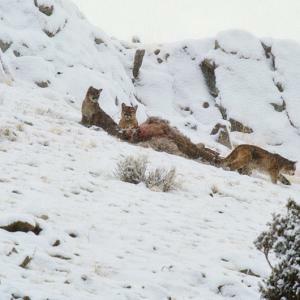 A cougar family on an elk carcass outside of Jackson, WY. While the statistics reinforce how unlikely cougar attacks are, we recognize that some people live or recreate in habitat where encounters may be more likely. Fears can be eased with a better understanding of these environments. For instance, most urbanites lock their doors and view this action as common sense. Why? Locking doors to protect yourself and your property only becomes common sense after gaining knowledge and assessing the risks of the environment within which you live. Similarly, if you are going to buy or build a home or recreate in a place where cougars and other wild animals live, you need to learn about their behavior and habits and learn how to act responsibly in this environment. There are many tips and safety measures for living and recreating in cougar country, as well as people/organizations to contact if an encounter is a serious public safety concern. Much of what you can do to coexist with the cougar is founded in education. Knowing your area, the cougars in your area, and what agencies to call to help you properly care for yourself and a cougar in the event of an encounter are simple ways in which you can protect yourself and the cougar.